In my opinion a Masala Coke has always been the perfect complement to any fiery coastal Indian seafood dish – especially my mother’s Clams Masala. 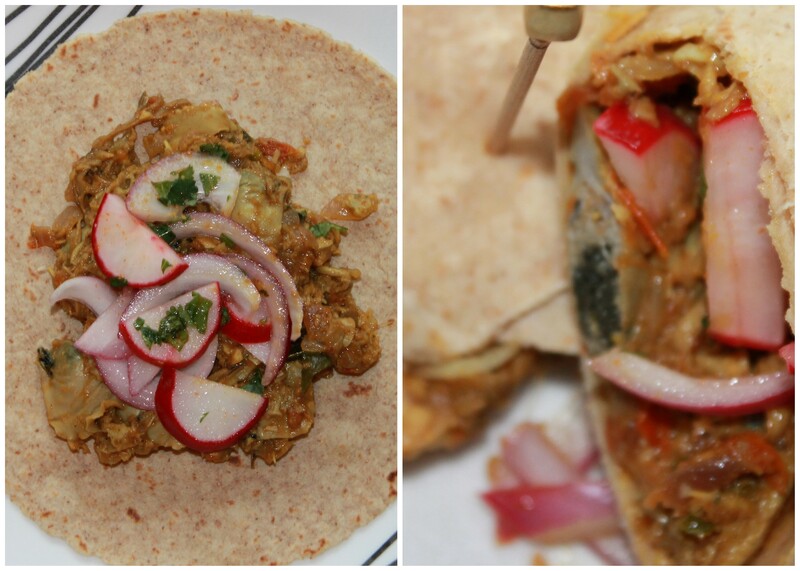 My recipe is a modern day rendition of my mother’s Clams Masala creating a wrap out of it and adding in some crunch and tang with the red onion and radish topping. Pair it with a chilled Masala Coke and you could momentarily migrate to the Western Coast of India….. just until the very last bite! If using frozen shredded coconut, make sure it’s fully defrosted. Asafetida is available in all major grocery stores as well as at Indian, Bangladeshi and Pakistani stores. Garam Masala is found in major chain grocery stores and Indian grocery stores. If you do not have store-bought Garam Masala, you can easily make and bottle your own. Here is an easy Garam Masala recipe. This is a spicy dish, so feel free to leave out the green chilies if you want to make it less spicy. You could also serve these as tacos! 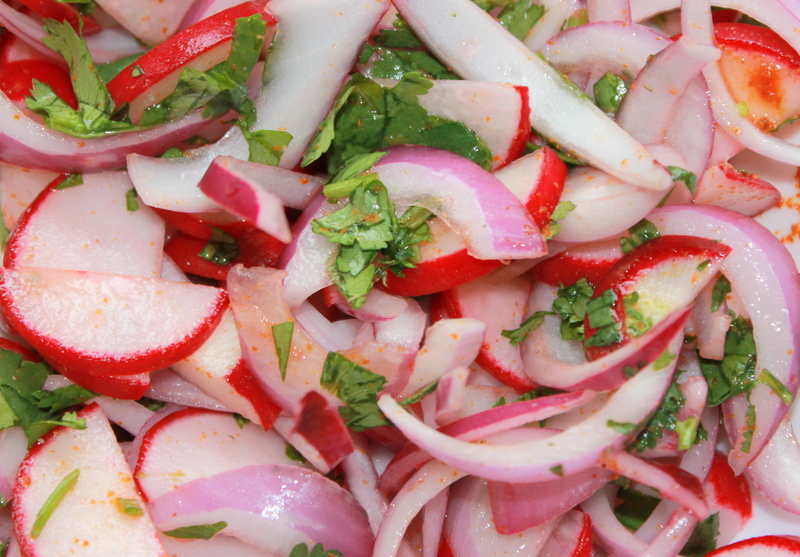 1) In a medium bowl toss together all the ingredients of the onion and radish topping and set aside. Doing this upfront provides time for all the flavors to blend well together. 2) In a small non-stick skillet toast the shredded coconut over medium-low heat till it turns light brown. Set aside. 3) In a large non-stick skillet heat the oil over medium heat. Add the asafetida and cook for a minute. Now add the curry leaves and green chilies and cook for 1-2 minutes until the curry leaves start to turn color. 4) Add the onions and cook stirring frequently until the onions are soft and golden. About 7-8 minutes. Now add the ginger paste and garlic paste and cook for a minute stirring frequently. 5) Add the diced tomatoes along with a pinch of salt. Cook the tomatoes stirring frequently and breaking them down with a wooden spoon. Cook until the tomatoes break down completely and the oil separates. 6) Add the toasted coconut along with the dry ground spices and cook for another 1-2 minutes. Add 2 tablespoons of water and mix everything well. 7) Add the clams and cook everything together until the clams are well coated and the water almost dries out. Be careful not to overcook the clams as they will turn rubbery if overcooked. 8) Turn off the heat and add 3/4 teaspoon of tamarind paste and salt according to taste. Be careful to first taste and then add salt as the clams can be slightly salty. Taste and add more tamarind paste or salt if required. 9) In a slightly warmed tortilla (microwave for 20 seconds) add some of the clams masala and then top with some of the onion and radish topping. Roll up the wrap, secure with toothpicks and cut in half and serve immediately. For a refreshing drink with these wraps try Chef Maneet Chauhan’s Masala Coke Cuba Libre. This looks wonderful. So, do you usually use canned clams? Any other substitutions for the clams? It really depends – if I am making a dish that requires the de-shelling then I tend to cheat and used the canned kinds. Trader Joe’s has great ones. You could make this with shrimp or boneless chicken pieces. I think the book’s target audience may not necessarily have all the spices to make a tandoori masala from scratch and also may prefer to buy one spice vs.a lot of spices. Then again I agree with you that a Tandoori chicken made with all the spices from scratch will taste way better than one made from a boxed tandoori masala. I read about asafetida a year or so ago, but forgot how to spell it, thanks for the reminder. Interesting recipe.